Ashen Stars RPG Available Now! Ashen Stars  is the newest full-length, stand-alone GUMSHOE product from RPG legend, Robin D. Laws. They call you lasers. Sometimes you’re called scrubbers, regulators, or shinestars. To the lawless denizens of the Bleed, whether they be pirates, gangsters or tyrants, you’re known in less flattering terms. According to official Combine terminology, the members of your hard-bitten starship crew are known as Licensed Autonomous Zone Effectuators. You’re the seasoned freelancers local leaders call when a situation proves too tough, too baffling, or simply too weird to handle on their own. In the abandoned fringe of inhabited planets known as the Bleed, you’re as close to a higher authority as they come. – The durugh, hunched, furtive ex-enemies of the Combine who can momentarily phase through solid matter. – The humans, adaptable, resourceful, and numerous. They comprise the majority of a typical laser crew. – The kch-thk, warrior locust people who migrate to new bodies when their old ones are destroyed. – The armadillo-like tavak, followers of a serene warrior ethic. – The vas mal, former near-omnisicent energy beings devolved by disaster into misshapen humanoid form. Ashen Stars  also contains extensive, streamlined rules for space combat, 14 different types of ship, a rogues gallery of NPC threats and hostile species’ and a short adventure to get you started in the Bleed. 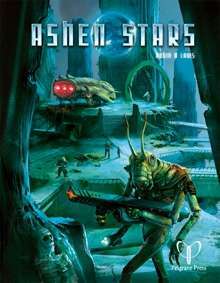 Ashen Stars is available at the Flames Rising RPGNow Shop .